Towards the end of my last post I touched on the fact that Microsoft’s recent announcement to drop Small Business Server next year has given particularly its partner community, reasons to look around at potential alternative solutions to Exchange. 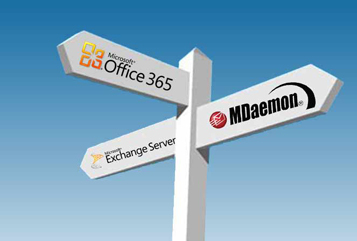 In this post I take a moment to highlight some of the reasons MDaemon Messaging Server should be on that list of alternatives you might be considering, including how the costs look alongside the equivalent Microsoft products. Perhaps you’ve never heard of MDaemon? Perhaps you used it many moons ago and are just a little out of touch with how it’s evolved? Maybe you’re an evangelist but still have to sell Exchange because it’s the “bigger brand”. Whatever your background, if you’ve been used to using SBS and therefore Exchange, you’ll no doubt be aware it’s reaching end of life in June 2013. With that in mind, now seems the perfect time to highlight some of the reasons you should be considering MDaemon as a replacement. If you’d like to look at the features in more depth, there’s information and a 30-day trial available at www.mdaemon.co.uk. So how do the costs compare? While I appreciate it’s never good to be competing solely on price, it is a factor when looking at alternatives and the gap between the cost of MDaemon and that of Office365 and “full” Exchange is significant enough that I feel it’s worth highlighting. Why only Office365 and Exchange in this comparison? Well once SBS reaches end of life, If you’re a small business (up to 75 employees) with one or two servers (physical or virtual), these are the two main Microsoft options you’ll be limited to if you want the basics such as domain control, file and print share plus email. For the purpose of comparison, I’ve assumed you’ll be using one of either WSE 2012 or Windows Server Standard 2012 as your server platform and concentrated on comparing the software or service providing the email functionality. The table below breaks the RRP cost down for each, showing first and second year licence costs along with a figure for the two years combined. *second year costs for Exchange 2012 represent the cost of Microsoft’s Software Assurance and MDaemon’s represent the renewal cost of the renewal price prior to the upgrade cover expiring. 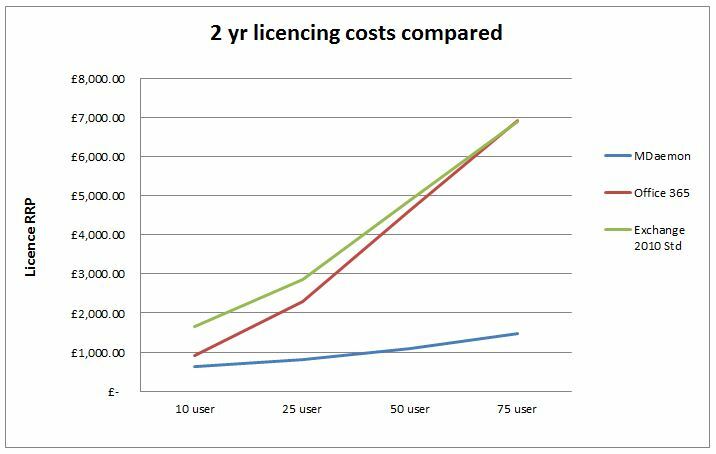 Below is a graphical view of the total cost of licencing each of the mail platforms over the course of two years. It’s not too surprising to see that beyond the 25 user mark (the cap for WSE 2012), the gap in cost really begins to close between hosted Exchange and Office365. You’ll notice there’s a considerable saving, particularly at this point of opting for MDaemon over either service. Installing the software for yourself is the best way to understand it properly but if you’d prefer one of the team here guide you through a tour of MDaemon by all means get in touch – alternatively, the links below will take you to some useful info. I can only see these non- Microsoft email servers picking up favour again. Can’t help but think Microsoft have shot themselves in the foot somewhat. Yes it certainly seems that way in the short to medium term at least Paul. In some ways it’s quite nice to see bold decisions being made at the top but the issue is that they really do seem to be a little out of sync with the channel’s requirements at the moment. For some I guess it’s probably a much-needed wake-up call to do some planning for the future, for others I imagine it’s just an unwanted distraction from the day job. Interesting you should say that Jarrod – we’d been discussing the same thing internally but it’s a difficult sell unless you can run it on a Linux platform and that’s not really where our expertise lie. We will keep looking though! info and I figured out just what I was basically looking for.